Monday March 10th 1884 I washed this forenoon and soon as I ate my dinner went up and gave our vacant room up stairs a good cleaning up. I then went to town and got a dress for May was at Hatts a little while wrote a letter to Vene in the evening. Tuesday March 11th 1884 I got the ironing all done by noon and cut out Mays dress in the afternoon and worked on it. I wrote a letter to Will in the evening. 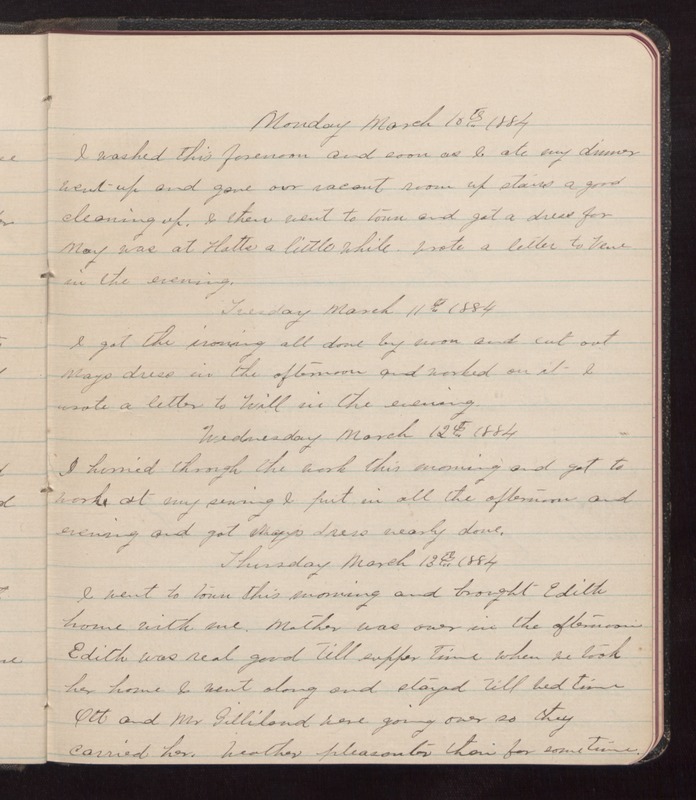 Wednesday March 12th 1884 I hurried through the work this morning and got to work at my sewing and put in all the afternoon and evening and got Mays dress nearly done. Thursday March 13th 1884 I went to town this morning and brought Edith home with me. Mother was over in the afternoon. Edith was real good till supper time when we took her home and sent along and stayed. Will had time. Ott and Mr Gilliland were going over so they carried her. Weather pleasanter than for some time.